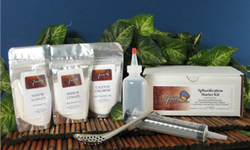 Reviews and information of Molecular Gastronomy and Molecular Gastronomy Kits. From Texturas to Artistre and Willpowder - The source for molecular Gastronomy. The best values for all your culinary needs. 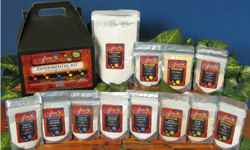 Latest news: Artistre has now launched a new updated version of it's Molecular Gastronomy kit. A new sleek insulated bag targeted towards both the home and professional chefs. Review from amazon site: :Awesome Products, Great Deal, February 6, 2011 This review is from: Experimental Kit Artistre - 600 grams (Misc.) This is a great deal. They give enough of each product to try multiple things with each chemical. They give you the chemicals to make foams, airs, gels, to do spherification, transformations, emulsification and thickening. Fun to experiment with, but also has very practical uses, especially for gourmet food. Chef Ferran Adría uses molecular gastronomy in his food, so does Wiley DuFresne. The molecular gastronomy kit contains 12 pouches with approximately 50 grams of the latest products from the Artistré line. You can experiment and develop recipes before buying a single product. This gives you the freedom to try before you buy while cultivating the gourmet in you. The Basic Spherification molecular gastronomy kit is created by submerging a liquid mixed with Sodium Alginate into a bath of Calcium Chloride. This technique allows you to create the solid elements that can be shaped into spheres. The spheres are composed of a gel-like membrane on the outside while keeping the liquid on the inside. Sodium Citrate is used to correct the acidity to create the inner component when using highly acidic substances like citrus fruit. The Artistré line of products allows you to create spheres in any shape you can imagine from caviar eggs to egg spheres.